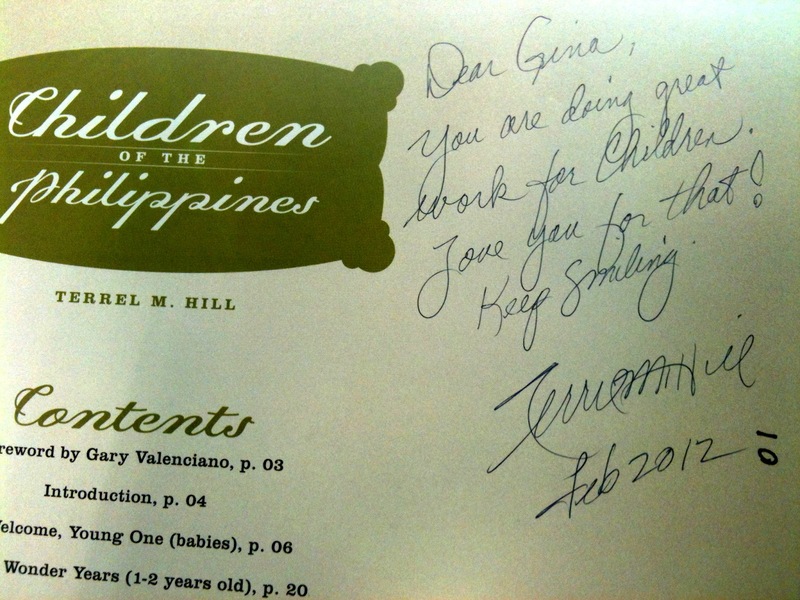 ... getting an autographed copy of Children of the Philippines from its writer and photographer, Dr. Terrel Hill. Dr. Hill, the former UNICEF Philippines Representative in the late 90s up to 2003, is one of the sweetest people I know. I'd gladly adopt him as my grandfather if he'd let me. He turns 69 this year and is as sprightly as ever despite an injury on his right arm. Last year, he gave me such a strong bear hug that he actually lifted me off my feet for a few seconds. I think if it weren't for his present injury, he would have done the same kind of hug again. Today, he wrote the most loving message on my copy of his book, which he insisted on giving to me for free in spite of my protestations. Children of the Philippines is a book containing beautiful photos which Dr. Hill took during his stay in this country. He loved the Philippines and its children so much that even when his term as Representative ended, he decided to set up a foundation for Filipino children and make this book. He visited the office today, on a Monday that's normally like other Mondays which come with a barrage of tasks that all need to be accomplished A.S.A.P. Whenever Dr. Hill visits, I feel calmer, lighter. And loads happier. People in the office tend to gravitate towards him, smiles breaking across their faces--because he does generate that kind of reaction from individuals. You can tell that he's always welcome in our workplace. Thank you, Dr. Hill, for your hugs and for your written message, which gave me a galvanic kick to the heart on a day when I welcome it most. I wish I had the time to sketch more. It seems I only get to do it during moments when I have to save myself from perilously falling asleep. On one very important yet--sadly enough--dreary conference where you could actually do a counting game on how often the term 'Excel spreadsheet' crops up, I decided to keep my eyes and hands busy even though my brain cells were somewhat shutting down. So I started sketching on my Moleskine an image of the winged goddess Victory of Samothrace based on a photo I took of the actual sculpture when I was in the Louvre last March 2010. I can never draw the human form from memory; that's a skill I sorely lack. But I feel a sense of happiness from being able to sketch on paper whatever I can see from my own eyes. I normally use a black tech pen like Pilot for informal amateur sketches like this. I never use pencil. Art class in high school taught me to be conservative in pen strokes so that I don't have to depend on using a pencil for drafts so much. I ended up having an affinity for pen-and-ink and even charcoal. I remember bringing home a rough charcoal sketch I made of Charles Dickens to show to my mom. I'm fearfully disastrous when it comes to watercolor, so I have made black ink my comfort zone. I don't consider myself an artist because I can't create something out of my imagination, but I'd gladly do a decent sketch of anything I clap my eyes on. Most museums, unfortunately, don't allow pens for sketching. So when I was in the Metropolitan Museum of Art in New York (for at least 10 times, damnit), I could only take high-res, close-up photos of sculptures which I would have wanted to sketch then and there. I'll probably set aside these photos for future moments of ennui that would allow me the time and luxury of drawing on paper. It's not perfect, and God knows I would have wanted the wings to have been less 'heavy-looking.' I remember gazing up at this sculpture, surrounded by fellow tourists and art lovers, and admiring how the artist captured Victory in mid-action, as she strode forward with a purpose, her wings elegantly outstretched. She seemed even more beautiful and mysterious without the head and the arms. I hope I have done this favorite sculpture of mine a little justice somehow. I remember too as I sat beside a young Italian man inside the Galleria dell'Accademia in Florence on that same month I went to Paris. There was a large crowd, as always, in front of Michaelangelo's David. It was sheer pleasure just to look at David (for aesthestic, purely non-sexual purposes) and study the tension in his limbs as he held his sling over his shoulder. The young man beside me (who looked like a local student about 21 years old) was using a pencil to sketch the sculpture, and I admired his efforts to capture THE David. I'd be afraid to try it myself, actually. And if I did, it would take me days to finish the sketch. But the young man was drawing him reverently--hesitantly too, I'd say, as if he was dreadfully afraid to mess up on paper what was perfect right in front of one's eyes. His drawing was still rough, for he had just more or less started. I could tell he was struggling with the face--which has always been my own Waterloo. At least the young man and I had something in common. We chatted a bit (he in halting English and I in my atrocious Italian) and I made sure to compliment him on his draft. He seemed grateful and emboldened by my praise, and so he went back to sketching David's face with a noticeably steadier hand. I left his side eventually so he could spend the rest of the day drawing without much distraction. The entrance fee to the gallery wasn't exactly a trivial amount, so I'm sure he wanted to maximize his stay indoors. Sometimes, I idly wonder how his sketch turned out. And I wonder too if I would dare to sketch something as complex as David one of these days. I received a Kindle Touch for Christmas while I was in the U.S. and it's honestly the best gift I've ever gotten. It amazes me how much reading I get done with this Kindle, and it's pretty handy to carry around while traveling. I read in the NYC subway, at the bank while waiting for my turn at the counter, at the doctor's waiting lounge, and any other place that forces me to be in a state of inertia for more than 5 minutes. In a span of 7 weeks since I've gotten the Kindle, I've finished seven books and am in the middle of the eighth, which is Stieg Larsson's The Girl Who Kicked the Hornets' Nest. Considering how awfully slow I was last 2011 in tackling my book backlog, doing an average of one book a week on my Kindle now is a major improvement. 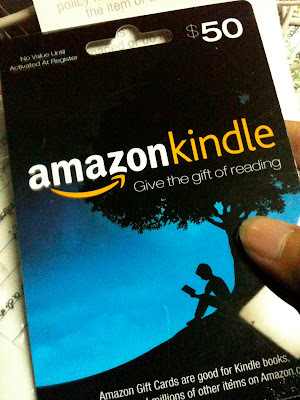 I find myself scouring the Amazon Kindle bestsellers list for good sales on a regular basis. Was able to buy Neil Gaiman's 10th Anniversary edition of American Gods for less than $4 (!!!) and bought Stieg Larsson's Millennium Trilogy at a discounted bundled price of $18.50. 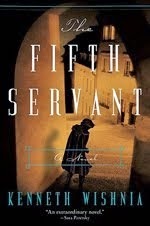 I also managed to download a whole bunch of Kindle-formatted public domain books for free. This means I can finally attempt to re-read James Joyce's Ulysses and Leo Tolstoy's War and Peace without straining my wrist from the weight of these books. Hurray for Project Gutenberg and all those groups who labor to make such great literature free and accessible. And now for the vain part. 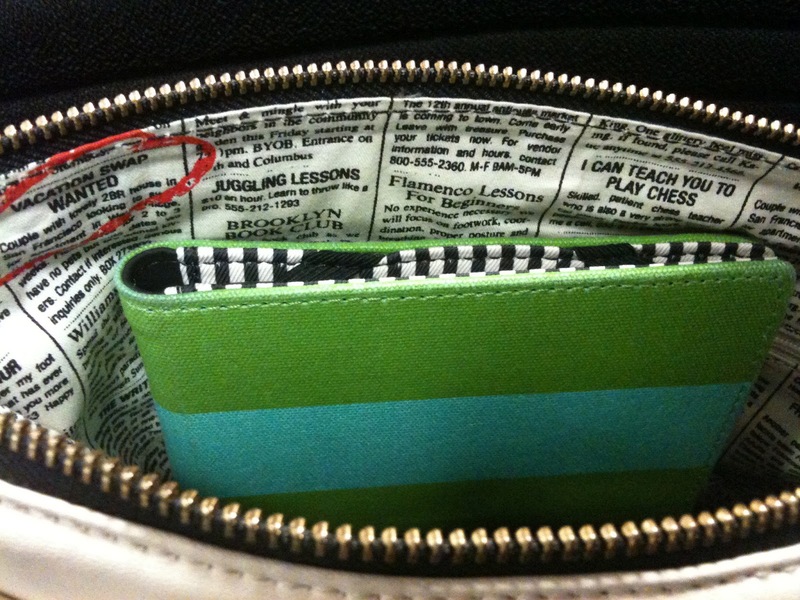 My Kindle in all its Kate Spade-covered glory. Yes, I had to buy a Kate Spade Kindle cover--because my beloved reading device shouldn't be decked out in anything that's less than Kate Spade. Straight from the box. And my first free Kindle e-book download was Popular Tales from the Norse. 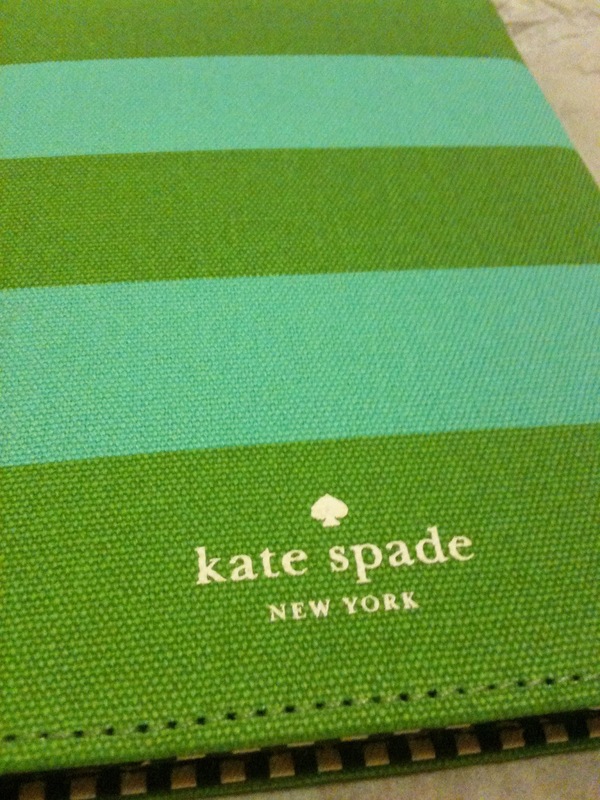 My Kate Spade Jubilee Stripe Kindle cover. Cheery blue-and-green stripes on canvas. I got this in Target. It's amazing how many Kindle e-books one can buy with $50. I'm trying not to use it up as much as I can. You now know what to buy me for my birthday or for Christmas. My Kindle is small enough to fit into my Kate Spade Call Me Hayden shoulder bag (which, by the way, has the most adorable bag lining ever). The Kindle doesn't change my love for printed books. Just this evening, I found myself reading A.S. Byatt's Ragnarok: The End of the Gods, and I know that there's still joy to be had in the physical turning of pages in one's hand. 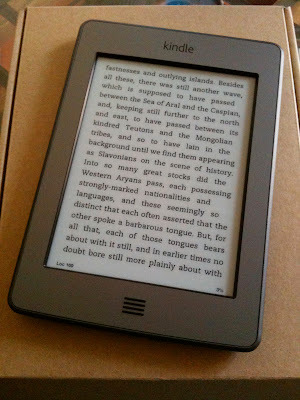 But the Kindle does make reading on the go beautifully easy. And oh that notion of having 3,000 books in just one device...! I can imagine growing old with you, Kindle.